Wrightstyle’s Technical Director, Lee Coates, takes a deeper look at the Bradford City fire (at the football stadium) and the consequences. This May will mark the 30th anniversary of one of the UK’s worst fire disasters, when 56 people died at Bradford City’s football stadium. Over 250 other supporters from both Bradford City and Lincoln City were injured, many seriously. There will be a service of civic remembrance, as well as other memorials – including at Bradford’s last home game of the season at Valley Parade against Barnsley on April 25th. Funds raised will go to the University of Bradford Plastic Surgery and Burns Research Unit (PSBRU). The memorials and fund-raising efforts are supported by The Football Association, The Premier League and the Football League. A minute’s silence will also be observed at football grounds across the country. 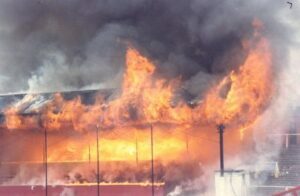 The fire was most likely caused by a dropped cigarette or match falling into a void area beneath one of the ground’s stands, and soon engulfed the whole structure, including the roof. Worse, people had to break down locked exits to escape. The subsequent Popplewell Report introduced new safety legislation for sports grounds across the country. While welcome, such reports have sometimes been called “codifying by catastrophe” – how fire and other safety regulations have often come about because of tragedy. In stadium design, the most awful example remains the UK’s worst football disaster, which claimed the lives of 96 Liverpool fans in 1989 – because of crush injury. The subsequent Taylor Report led to radical change, and the much safer stadiums we see today – including the elimination of standing-only terraces. As a mark of respect and remembrance for those who lost their lives as a result of the Hillsborough stadium disaster, all FA Cup, Premier League, Football League and Football Conference matches taking place on the weekend of 11-14 April will kick-off seven minutes later than originally scheduled. However, the real tragedy is that radical change hadn’t been enacted sooner – for example, following the Ibrox Stadium disaster in 1971, when 66 Glasgow Rangers fans were killed and over 200 injured in a crush on a stairway. The principal legislation relating to fire in major stadiums is the Regulatory Reform (Fire Safety) Order 2005. Under it, the club must plan, organise, control, monitor and review the necessary preventive and protective measures and record these arrangements in writing. In Scotland, the regulations are the Fire (Scotland) Act 2005, as amended, and the Fire Safety (Scotland) Regulations 2006. UEFA also offers guidance, making clear that “major lessons have been learned from the fire-related stadium disasters of the past.” They insist upon active measures such as extinguishers and sprinkler systems and passive measures such as fire sectorisation and fire doors. It’s those passive measures that we specialize in at Wrightstyle. We supplied elements to both the London Olympic main stadium and the adjacent ArcelorMittal Orbit, the 115 metre high observation tower. We have also supplied to the Athens Olympics, the Asian Games and FIFA – and, closer to home, to the national FA facility at St George’s Park in Staffordshire. Nowadays, major stadiums have crowd safety as their first design prerequisite; from entrances and exits that can cope with large numbers of patrons, to major incident plans (MIPs) to deal with any eventuality. Not least, modern stadiums are built with lots of concrete, steel and fire-rated glass to minimise the risks posed by fire. In many instances, it has been our ability to demonstrate independent testing against both fire and smoke that has proved a decisive factor, underlining the highly-specialist nature and international context of the steel glazing market. As we constantly point out, the main lesson for designers is not simply to build in passive and active fire systems, but to look at the whole stadium or building’s capacity to withstand a fire. For the glazed components, that should mean analysing the level of containment the glass will provide and its compatibility with its framing systems. Those levels of containment are absolutely vital in a stadium, with very large numbers of people in a restricted area and who, in the event of a fire, may not always follow proper evacuation procedures. Evacuation models, based on engineering and computational tools, don’t necessarily reflect the variable nature of human reaction. For example, if a family or group member is away from their seat when an alarm sounds – perhaps buying food on a concourse – they will often go back to their seat to find others in their party before making any decision to evacuate. It adds up to a delayed flight time that the stadium’s design and evacuation procedures must address. In buildings research, as much as two-thirds of the time it takes people to exit a building after an alarm is start-up time – time wasted in looking for more information, or not taking the alarm seriously. Stadia do, of course, have the advantage of having PA systems and a scoreboard on which information can be posted. However, human psychology is also at work, and the passive fire measures employed in the stadium’s design must also factor in a delayed evacuation response. That’s why modern steel glazing systems are so important, either for the exterior envelope of the stadium or for internal screens and fire doors. 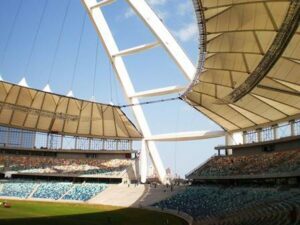 With advanced glazing systems able to provide up to 120 minutes of protection against the spread of fire, smoke or toxic gases, they have become an integral part of modern stadium design, giving people more than enough time to evacuate and protecting escape routes along the way. Stadium design has come a long way in the past few decades, driven by new regulations to deliver a new generation of safer stadiums. But it’s also a tragedy that it’s taken catastrophe to make it happen, particularly for those caught up in the Bradford disaster 30 years ago.